An early-morning street brawl outside the Wrigleyville McDonald's, 3620 N. Clark, was apparently caught on video yesterday. The footage, posted by YouTube user scavbh01, appears similar to circumstances detailed in a 2:35AM call to 911 on Saturday. 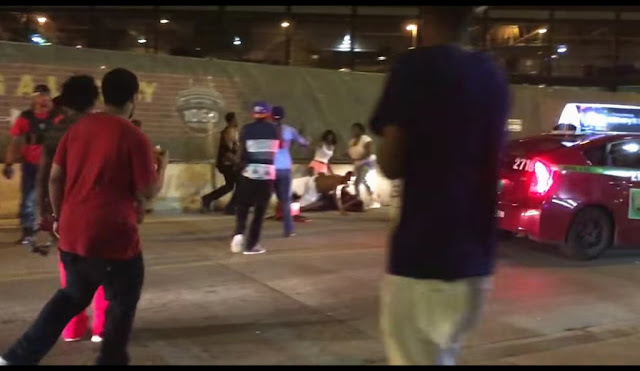 In the video, which appeared on YouTube Saturday, about a dozen people pour into Clark Street with several teaming up against individuals. A belt get whipped. A rock gets chucked. And the zapping sound of at least one stun gun can be heard throughout the 67-second recording. While the public is told time and time again about a police "entertainment detail" that supposedly pours over area nightlife strips to handle situations like this, there is no sign of 'em as this incident unfolds directly outside of Wrigley Field.